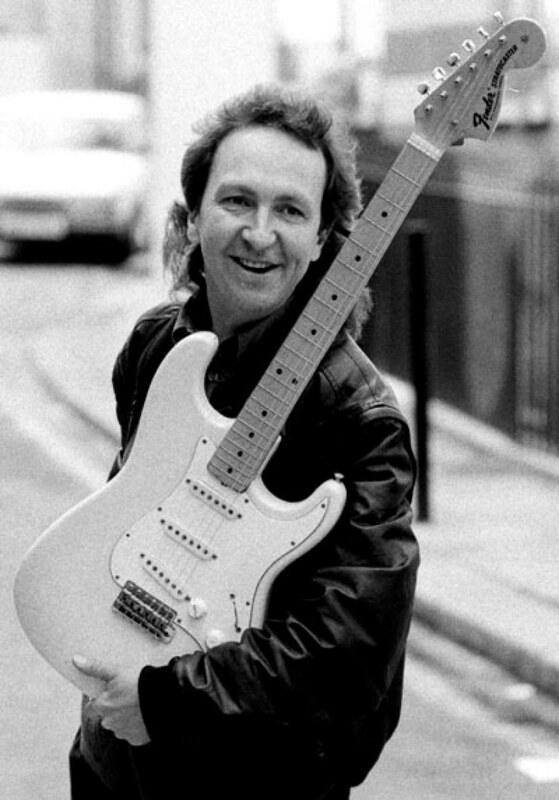 Jimi Hendrix Week: "I played Jimi's Woodstock Strat"
Back in 1990, I was editor of Guitarist magazine but had previously been Fender's UK guitar repairer. When Fender launched an Artist Centre in a famous London rehearsal complex they asked if I could help by setting up all the guitars for the prestigious opening. People who attended the event included Buddy Holly's widow, Maria Elena, and Mitch Mitchell, drummer for The Jimi Hendrix Experience. Fender's Artist Relations manager said there was one other instrument he'd like me to look at. This turned out to be Hendrix's most famous guitar - the white 1968 Fender Stratocaster that Jimi had played at Woodstock in 1969. Mitch Mitchell brought in a guitar case and nonchalantly opened it. The Stratocaster had been in the drummer's possession since Jimi's death in 1970 and this was the first time it had seen the light of day. Just glimpsing the thing was a 'Spinal Tap' moment of epic proportions. Mitch said it needed looking at because the frets had tarnished, the strings were rusty and he had decided to put it up for auction. I picked up the guitar and couldn't really believe it. I had watched Jimi play Star Spangled Banner on it in the film of Woodstock, and now it was in my hands. I studied the icon closely. 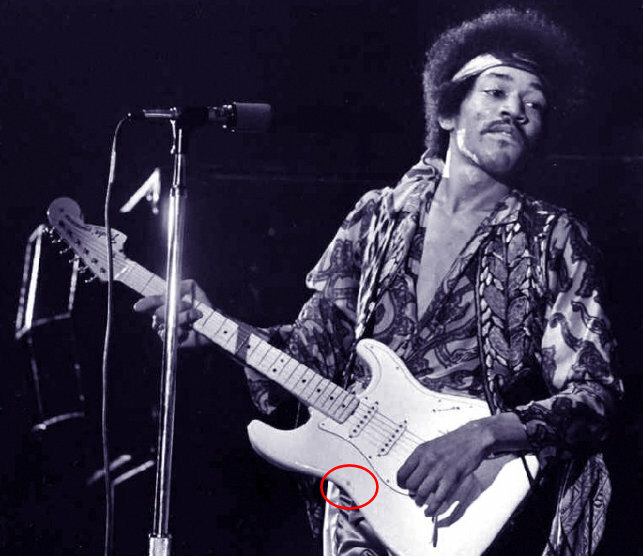 The nut had been switched around in its slot to accommodate Jimi's upside-down stringing method; it had a separate maple fingerboard (something Fender did for a short time in the late-'60s); cigarette burns were evident on the headstock (Jimi would secure his cigarette under the sixth string, and when he went off on an extended solo it would burn down to the stub); and there was staining from his shirt on the creamy-white finish. The strings were indeed rusty and the frets had gone a bit green. Interestingly, the spotted cat-fur strap (ocelot, I think - very non-PC today) was still in place. We later checked clutches of spots on the unfortunate feline's hide against photos of Jimi, and it was clearly one and the same. 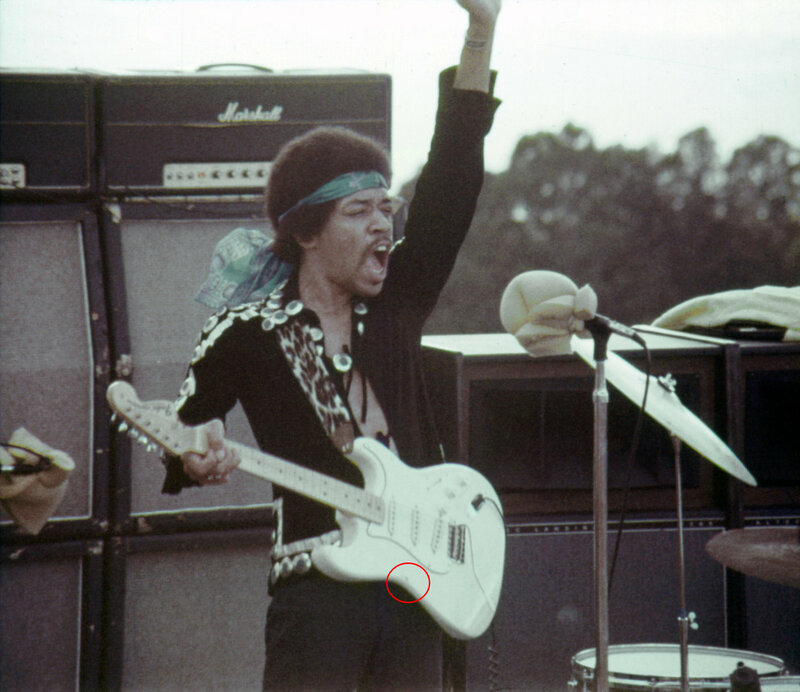 Hendrix didn't wear this strap at Woodstock; it seemed he changed it, as later photos (including the one on Guitarist's September 1990 cover) tend to confirm. Why didn't I keep the strings? Taking the guitar to my workbench I checked the neck for straightness and it needed a slight tweak of the truss rod. That done, I cut off the strings and threw them in the bin. Isn't hindsight a wonderful thing? Today they alone would probably be worth £50,000 (with Jimi's DNA all over them)! Having cleaned the whole guitar and polished the frets the next step was to restring it and set the action. It was weird to realise that the last person to do this might well have been Hendrix himself, as there are well-known photos of him doing it backstage before a gig. I threaded each string through the guitar's tremolo block, over the individual saddles, up over the reversed nut and onto the 'F'-stamped Kluson tuners. It didn't need a lot more doing to it, but I tweaked the saddle heights, made minor intonation and pickup adjustments and that was it. I did plug it in to an amp, but as I am right-handed and it was strung upside-down, a quick Little Wing was out of the question so I simply played a few notes to check that the electrics worked. In a final twist, I wrote up the guitar's story for Guitarist magazine and postulated that it might make £100,000 at auction. Having been asked to submit the article to Fender for their perusal prior to publication, it was suggested I reduce my estimate to £10,000, as the original figure was unthinkable to Fender. 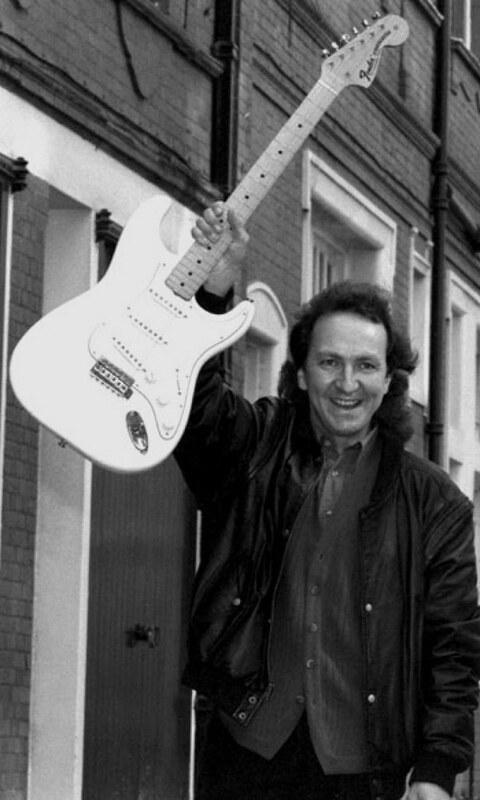 In the event it sold at Sotheby's for £198,000 - a record in 1990, when 'celebrity' guitars were a new phenomena. Since then the Woodstock Strat has changed hands again. Today it sits in the EMP museum in Seattle, Hendrix's birthplace. Neville Marten is an ex-Editor of Guitarist, and current Editor of Guitar Techniques. Last edited by RobbieRadio; 1 Week Ago at 08:39 AM. The guitar is currently on display at The Met in NYC. I plan to visit this weekend and can take some photos. Anything in particular to look for? note - on some photos from these shows the ding isn't visible as the guitar is over-exposed, especially where there's a spotlight on it. Maybe the one on display is a "looker" and the real one is still kept in the vault for safety reasons. Wouldn't be the first time a museum did this. Or maybe Jimi had 2 white stats, tuned differently for different songs and gave Mitch the wrong one. 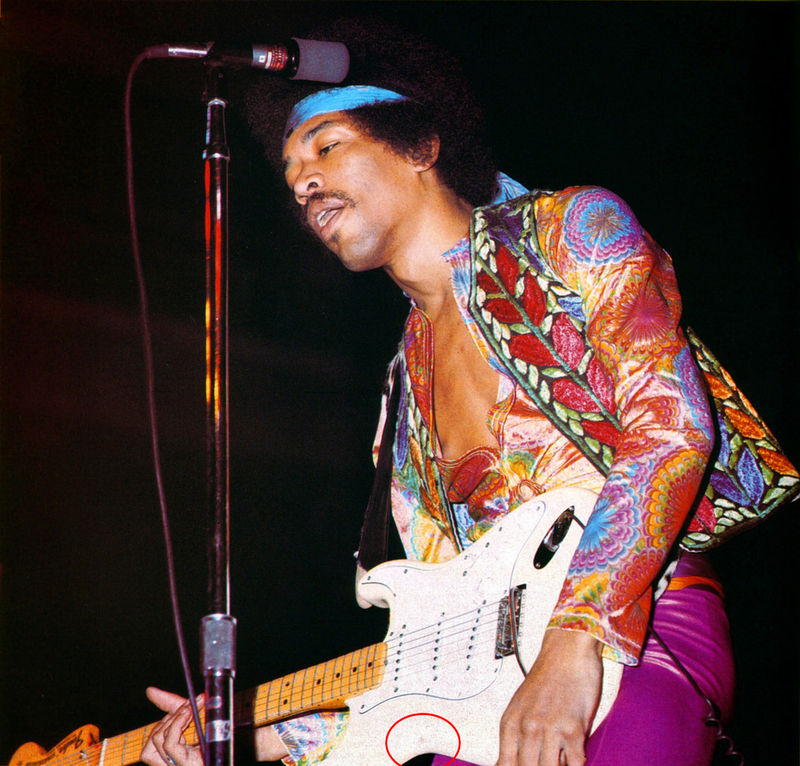 Or Jimi had a backup white strat and that was the one he gave to Mitch, but Mitch thought it was the Woodstock one. No "ding" on the one Mitch had. I've also been curious as to why it looks yellowed. I thought maybe the white had yellowed over time, but the last photo above (Fehmarn?) shows it yellowed in 1970. Thanks for the GoundGuitar link, whoever did that went through the same thought process as me, heck they even found pretty much the same photos. It looks to be an interesting site worthy of perusal. There's a close up photo of the headstock of the EMP strat that shows distinctive wood grain - I might search for some high quality/close up shots of the "dinged" strat to see if the wood grain is visible. ps thanks for the kind words about Just Ask the Axis - I had to transfer hosting to another site late last year. I did put up a "moving house" notice for a while and had a redirect when both sites were running after the migration, but the old one has now disappeared. The strings are not original. Mitch had them cut off and replaced while he owned it. 1. Between October 1966 and September 1970 I was the drummer of a musical group called The Jimi Hendrix Experience with Jimi Hendrix. 3. 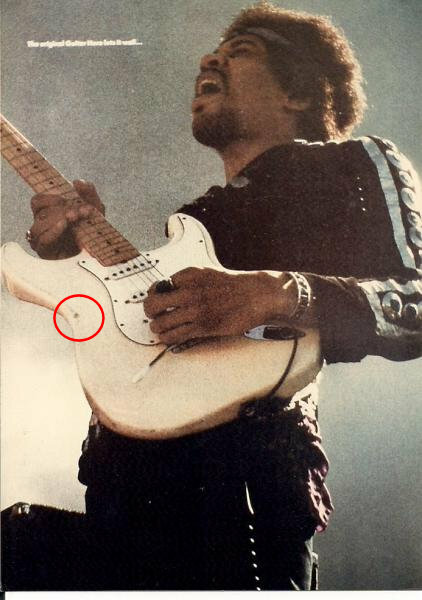 Jimi Hendrix was always breaking his guitars and getting new ones but this particular white Fender Stratocaster serial number 240981 was a particular favourite of his. He used it at the Woodstock Festival in August 1969 playing the now famous “Star Spangled Banner” on this guitar. I had given him a drum kit as a present some time before and I said to him “I’ll have that guitar before you break it up” (I do not think that he would in fact have broken this particular guitar). He said, as was his way “You got it” and he then gave me the guitar. In retrospect I think it was by way of a gift as my daughter had just been born a few days previously. I think this was one of the last gigs ever played by us. 4. 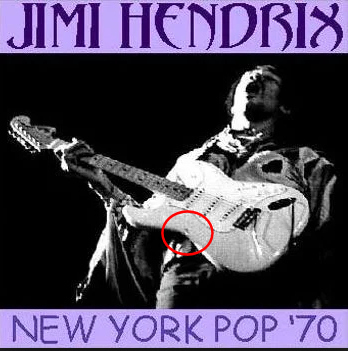 Jimi Hendrix bought the guitar from Manny’s in New York in 1968. As it was one of his favourites, it was used all the time at both live concerts and recording sessions. A picture of it can also be seen inside the Rainbow Bridge Album Cover and on countless posters and in most books written about Jimi Hendrix. 5. This guitar has never been out of my possession since it was given to me and it has remained in my possession until I delivered it to Sotheby’s in London for sale by auction. I make this solemn declaration conscientiously believing it to be true and by virtue of the provisions in the Statutory Declarations Act. Declared at 6 Clanricardo Gardens, Tunbridge Wells in the County of Kent. Now the question is: Where's the white strat with the ding in it? What happened to it? 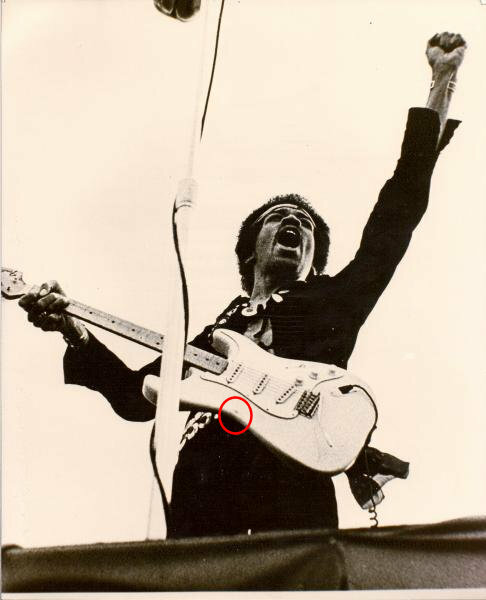 The "ding" on the body is no proof that it's not the same guitar, it could have been cleaned off in the same way the burns at the headstock were. There are other details that have been overlooked and could help establish the guitar's identity such as the headstock decal placement, string tree position, wood grain a.o. I doubt there were two white ones, but there were almost certainly two black ones (for more on this you can check the article here). Thanks. Very interesting. I'm going to see it later today. Anything in particular that would be helpful to have photos of? Although quite difficult to capture, I'd focus on wood grain patterns anywhere on the neck. 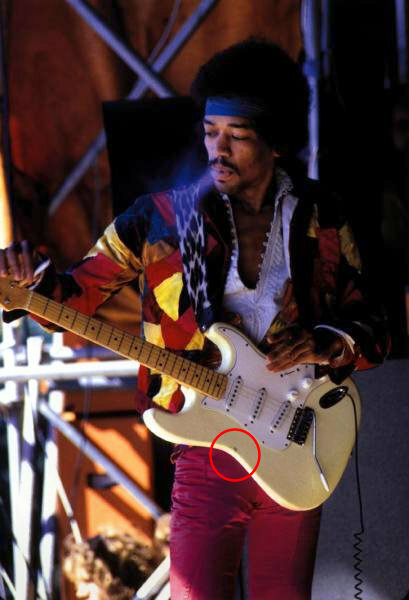 "I doubt there were two white ones"
Jimi owned 9 white Stratocasters in his lifetime, albeit some were put together with parts. Interesting. Would it be possible to check photographs on the serial number 240981? I am obviously referring to the white/maple cap necked one used from late '68 onwards and not any of the earlier guitars. No offence to the guy at Groundguitar but he's making all these assumptions based on a mark which could have been removed while almost everything else matches up.